Fujizuka at Shinagawa Shrine (品川神社富士塚) is a miniature Mt. Fuji. FujizukaIt is a spiritual spot just like Mt. Fuji. It was built in 1869. Worshipping to Mt. Fuji was not easy for long time. It was built for those who couldn't climb up the real Mt. Fuji. It has great view of Shinagawa area. There is a opening festival in July 1 just like Mt. Fuji. The faith to Mt. Fuji has been respected for long time. Over 300 people joined the construction. Some of the lava stones are actually the rock of Mt. Fuji. 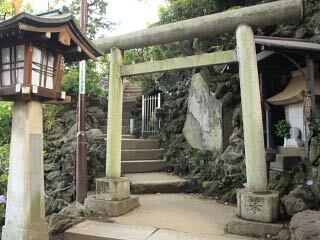 There is Sengen Shrine at the entrance.